Oil stains are a common problem that people often complain about because it leads to bad smell from the area and it gives a bad image to the area. 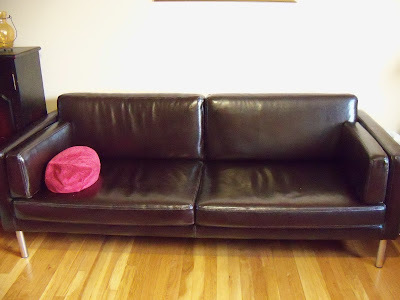 Imagine that you recently bought a new leather sofa to be placed in your drawing room. You buy really expensive one and guests come to visit you. A little kid with the guest drops oil from French fries that you just served them. The oil soaks in your new leather sofa. You have no option but to remove that oil stain from your very new sofa. Similarly because of any reason your fancy handbag or adorable shoes are affected by oil. There are many methods of removing oil stains from Leather depending on the availability of materials for cleaning and depending on how deep the stain is. Some methods are really expensive and therefore it is advisable to start with homemade remedies that are not very expensive and results in efficient results. However, it is very important to clean the stain as quickly as possible before the stain becomes deep and smelly which you really do not want to happen. You can adopt any one of the following methods for the removal of Oil Stains from Leather. · Baby powder or talcum powder which will be easily available at your home. · Scrubbing brush or if you do not want to buy a scrubbing brush, toothbrush will also be perfect in scrubbing the stain away. · White towel or pieces of cloth or white tissues. 1. Pour talcum or baby powder all over the stain. 2. Talcum powder will absorb as much oil as possible. Make sure to leave the powder on the stain for at least five hours and not less than that. 3. After that, you should scrub the stain away with a scrubbing brush or a tooth brush and the stain should be removed. 4. If the stain still appears then in that case apply more talcum powder for greater number of hours and scrub again. 5. Then boil some really hot water and dip a metal spoon in that boiling water. 6. Take it out after 30 seconds, then iron the stain with metal spoon making sure that the spoon is hot. 7. Press some white tissues or towels over the stain. 8. Then press the tissue with the help of hot spoon which will aid the tissue to absorb some oil upwards. 9. Then moist some cotton balls with the help of lighter fluids which will act as a solvent. 10. Rub the Oil Stain with cotton balls; keep doing it until the stain vanishes completely. · A brush for scrubbing or tooth brush for scrubbing. · Pieces of white towels. 1. Pour some vinegar on the area that has stain on it. 2. Leave the vinegar on the stain area for at least twenty minutes. 3. Use hair spray on the stain. 4. Scrub the Oil Stains with a scrubbing brush or a tooth brush. 5. Keep scrubbing after which the stain will be removed. 6. If the Oil stains still appear then in that case you may apply bit of salt and then scrub it again to remove the stain completely. · Small pieces of towel. 1. Wet the area that has stain. 2. Then press white small towels on the stain area so that it can absorb oil. 3. Apply Dish washing detergent on the stain and remain it there for some time. 4. After that scrub the stain area with a brush. 5. If you were unable to purchase a brush, you can also use a toothbrush for scrubbing as it will save cost. 6. The stain will disappear if you have effectively scrubbed the stain. 7. You may redo the process if the Oil stains still appears. 1. Make sure you do not use lighter fluid where there is smoke or heat as it is dangerous to do so. 2. Often corn starch is used instead of baby powder; however, the first priority should be powder as it leads to good smell and does the job more effectively. 3. Make sure to wear gloves when handling metal spoon. 4. When using hair spray make sure that you do not touch you eye as it can effect badly. 5. Make sure not to over apply the liquid detergent as it may destroy the leather further. 6. Scrubbing takes time and effort, so make sure you buy a comfortable brush that is easy to hold and easy to scrub. So that scrubbing is done effectively.